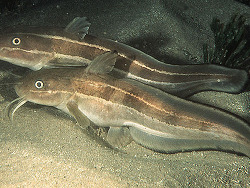 There are fresh and saltwater catfishes and some that can move between these habitats, but only a single species has had any impact on the seawater fishkeeping , Plotosus lineatus. 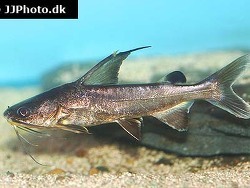 All catfishes share several features that immediately identify them as a catfish. 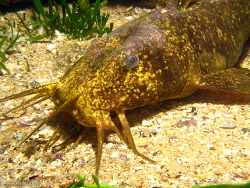 These include the eight barbels around the mouth, the scaleless skin and the venomous spines in front of the dorsal and pectoral fins. 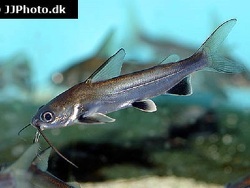 Catfishes have a remarkable sense of hearing due to a sound amplification system called the Weberian apparatus. Normally the neatly-marked juveniles of the Plotosus lineatus are sold as a marine fish, but since the adults are 30 cm long and rather drab by comparison with most other ornamental marine fish, they haven't become at all popular. While they can be maintained in marine aquaria, they will do equally well in mid- to high-salinity brackish water tanks where the specific gravity is maintained at 1.010 or more. 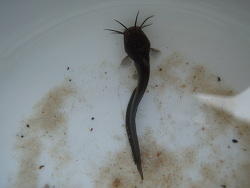 Adults in particular seem to be very accommodating, and have even been found in completely fresh water. 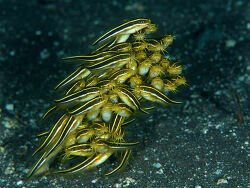 Plotosus lineatus is a schooling fish when young, but adults are territorial are usually end up being kept alone. They are predators, but will mix fine with fishes too large to eat.